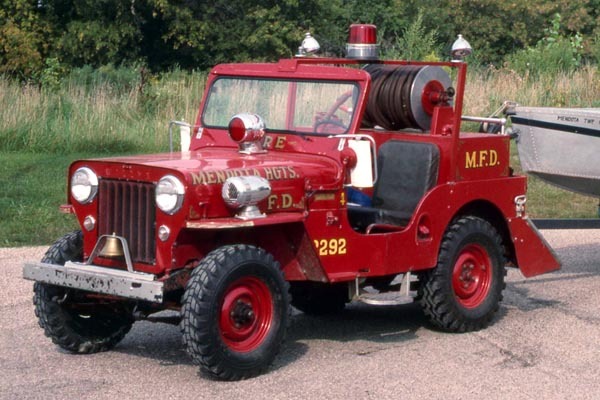 I've run across several unusual brushfire Jeeps recently, and I suddenly realized that although they span the last half century, they all come from the state of Minnesota. It's possible that this tradition of developing innovative local tools for firefighting was partly inspired by Minnesota's history of devastating wildfires in the late 19th and early 20th centuries, including the Great Hinckley Fire of 1894 and the Cloquet Fire of 1918, each one of which killed over 400 people. Matt Lindberg in Kimball MN sent this photo, looking for help identifying the little pumper he couldn't resist buying in an online auction from the Almelund Threshing Show, who had received it as a donation years ago. 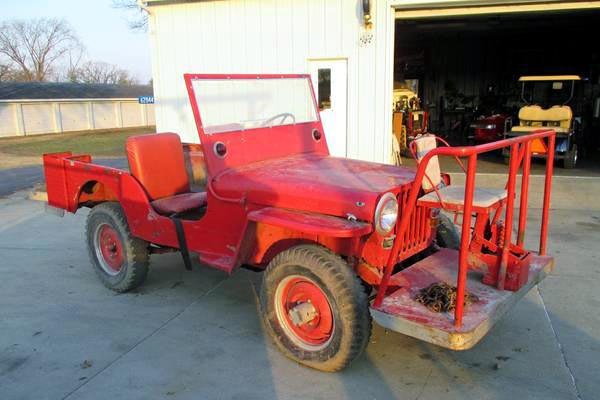 He says, "It is definitely a CJ chassis with a Jeep drive train. I believe that it is factory built, as the workmanship is much better than a rookie could do." 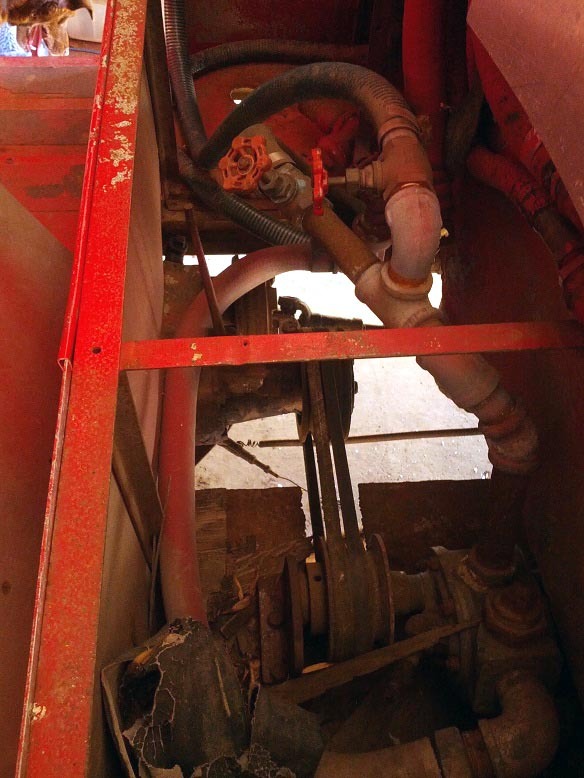 It also has rear overload springs (80K JPEG) and a PTO-driven pump (90K JPEG). 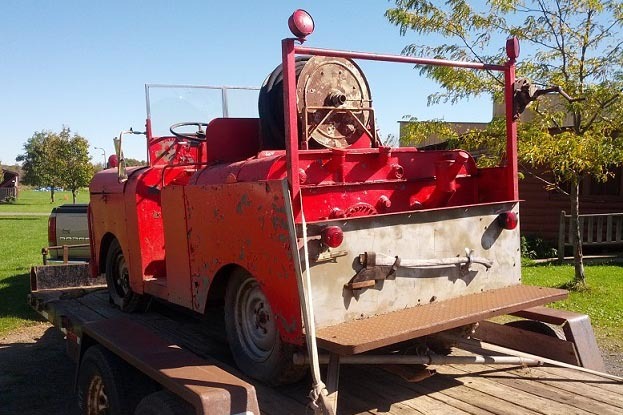 As Matt says, "It is a fully functional fire engine pumper." The body includes a hood raised to create storage space in the front, and a rear step with hand-cranked siren. I hope somebody knows who built this unique piece of apparatus. The only badge Matt found is the Willys gearshift instructions in the somewhat cramped cab (80K JPEG). 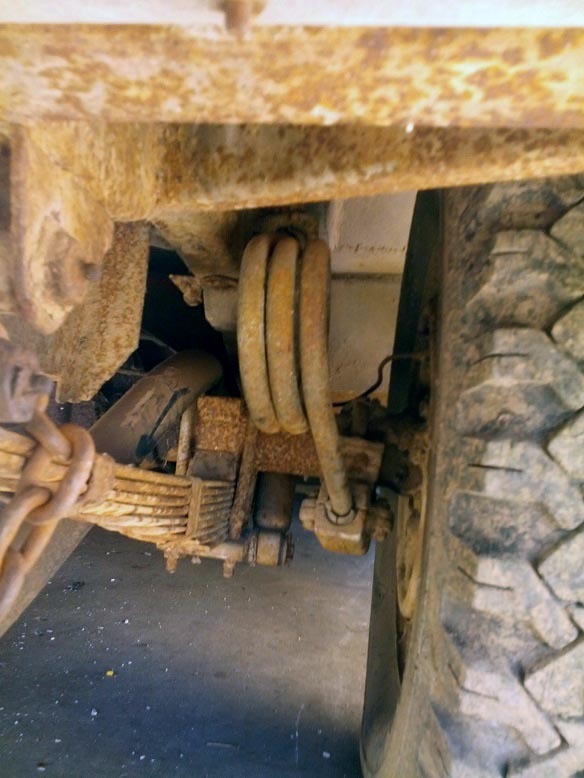 The original Jeep body must have been a write-off, for somebody to start from scratch like this. 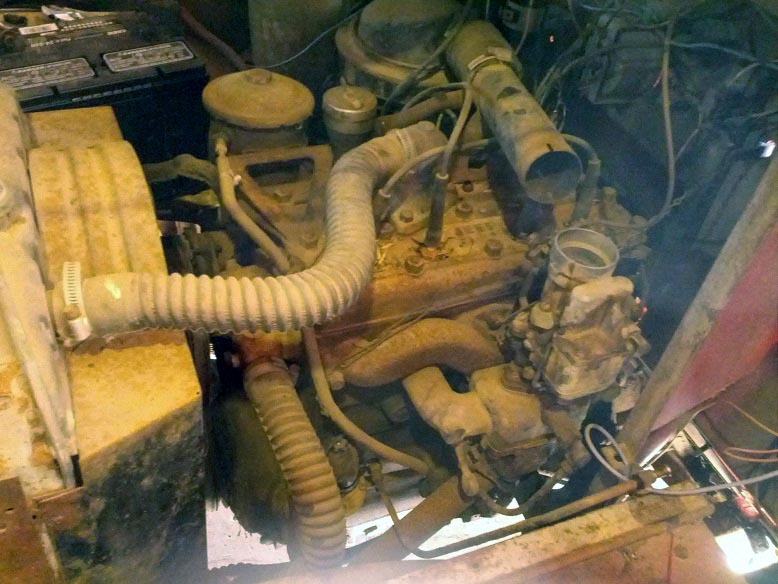 Readers at a few online forums were unable to offer much help, except that the L-head engine (100K JPEG) with engine number 2T16505 probably came from a 2WD Willys truck. 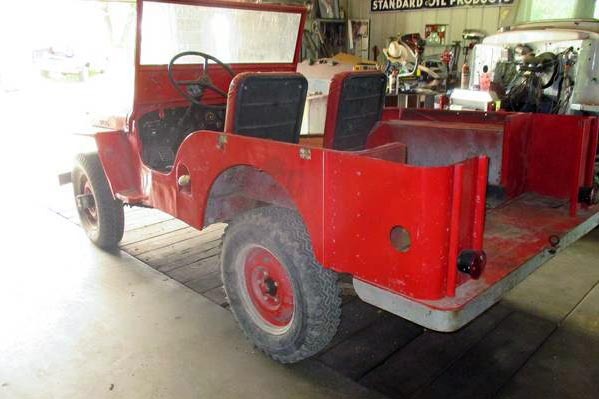 In 2016, the Jeep was sold to Andy Harvey of Pennsylvania, who as of 2018 is still looking for the origins of the front bodywork, which he thinks must have come from a factory vehicle. The Jeep carried number 2292, but was also known as Brush 11. It could pump 70 gallons of water per minute from a 100-gallon tank, with a pump on the passenger side floor. 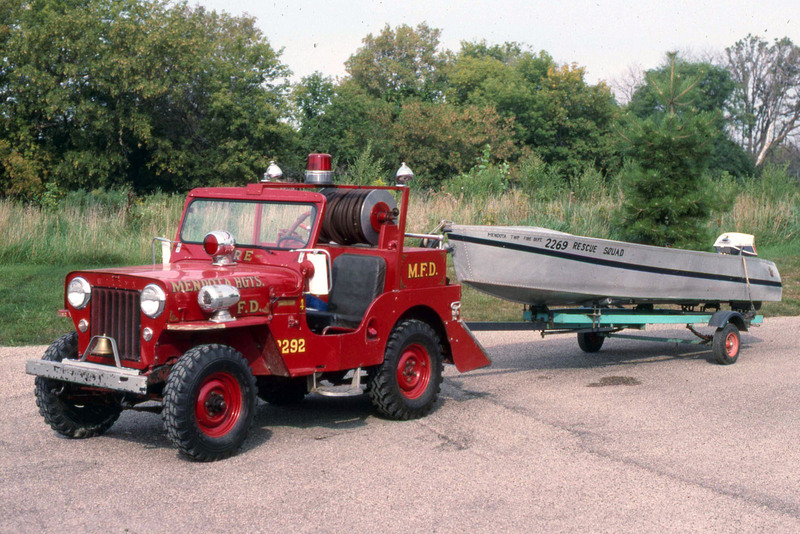 This photo of the Jeep pulling the squad's rescue boat (380K JPEG) was taken by NorthStar Firepics, not long before Brush 11 was taken out of service in 2014, after 60 years! 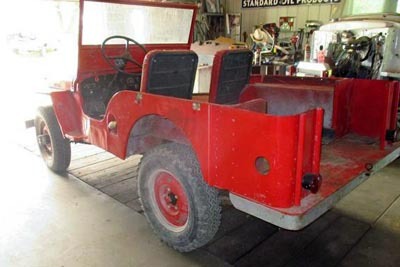 I ran into another Minnesota CJ-3B a while ago, being restored in Ed Spigle's Dream Garage in Virginia. 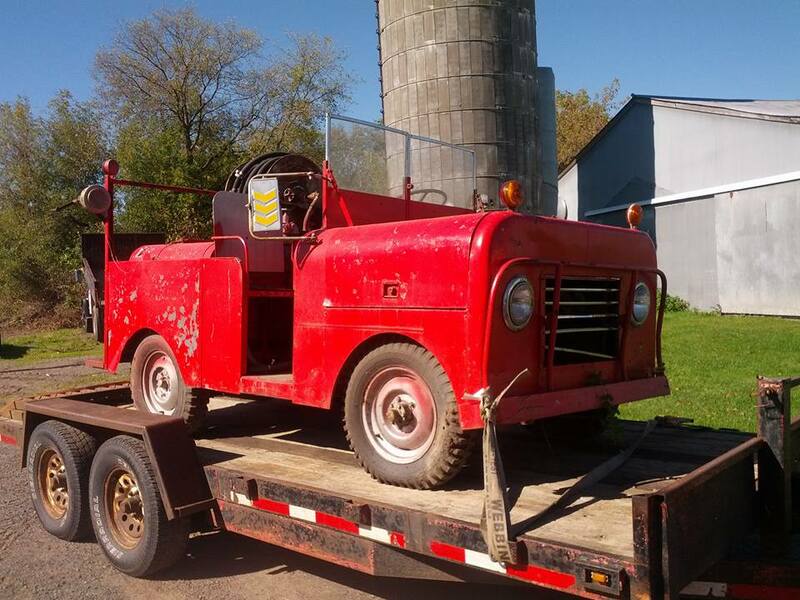 It's originally from Lexington MN, whose Fire Department History says it was built by the department on a stripped-down Jeep in 1958. But it has the same distinctive configuration as Mendota Heights 2292, with the pump in place of the passenger seat. Anybody who wants to ride along, can use the big rear step (90K JPEG). 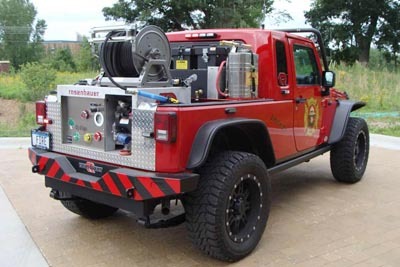 Minnesota is still building state-of-the-art nimble brushfire rigs. Burnsville Offroad put this one together for the City of Eagan (just down the road from Mendota Heights) on a JK Wrangler modified with the Mopar JK-8 pickup conversion. 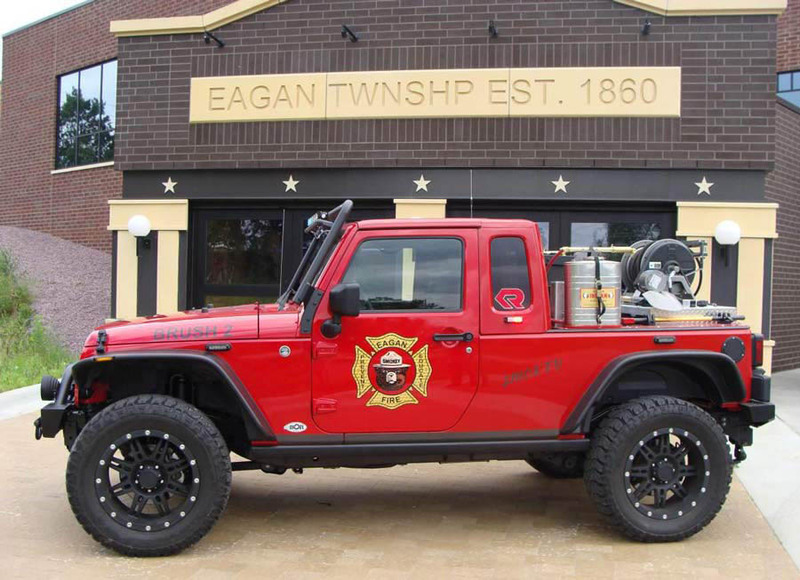 The Eagan Fire Department wanted a vehicle that could navigate the hiking trails in Lebanon Hills Regional Park. 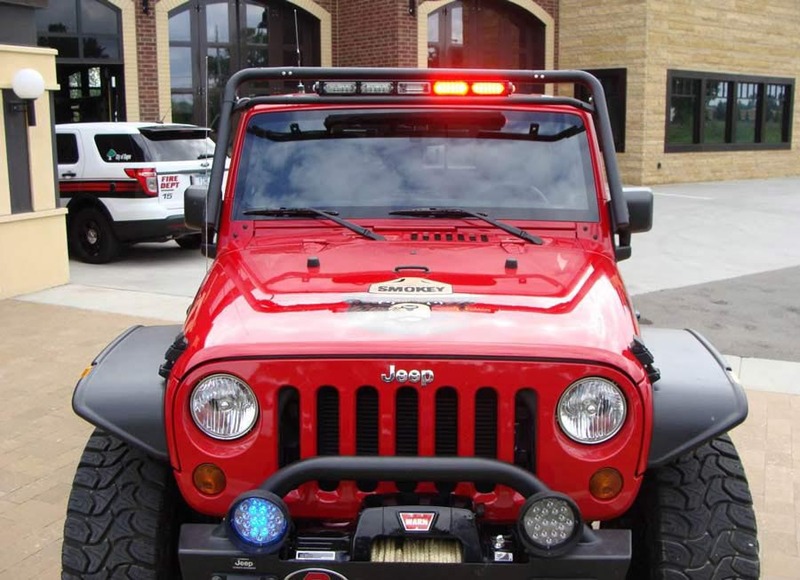 Much of the parts and labor were donated by Burnsville Offroad, Rosenbauer Pump, Whelen Lighting and Park Chrysler Jeep. The Jeep carries Minnesota plate "FIRE". 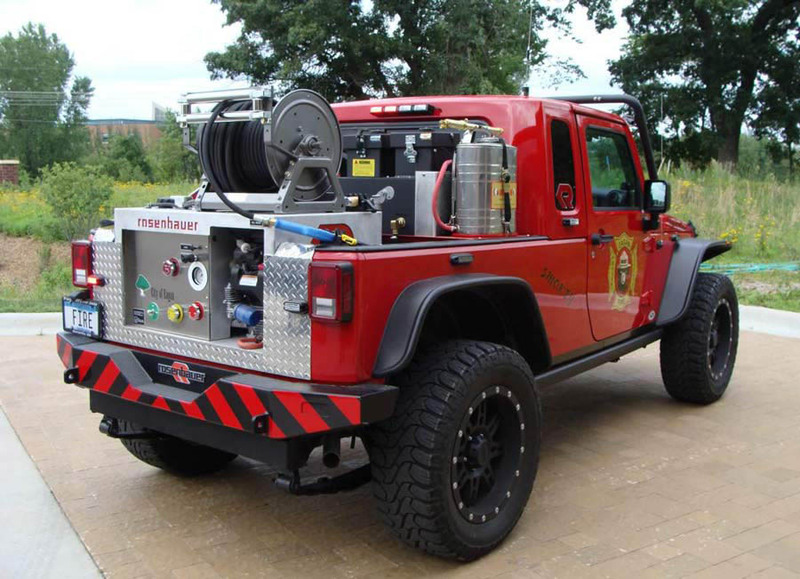 Burnsville installed rear leaf springs from a J8, thanks to Chrysler Corporation, as well as Dana 60 rear and Dana 44 front axles, and Dodge half-ton brakes all around, to handle the 1100 pounds of firefighting equipment and water. The Rosenbauer Ultra High Pressure System (UHPS) will pump 10 gallons perminute at 1400 PSI. 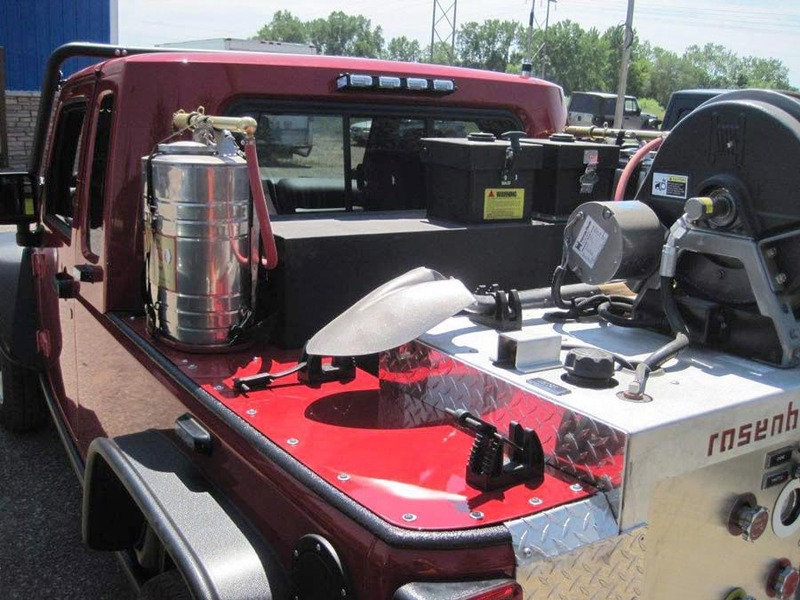 It has a 60-gallon water tank and a 6-gallon foam tank. 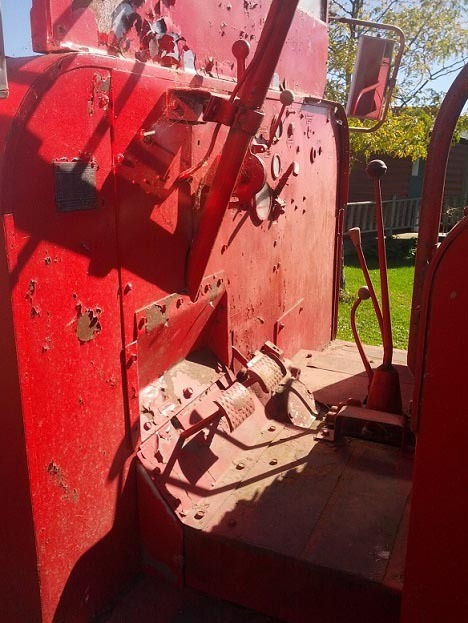 See a closer photo of the equipment on the rear deck (110K JPEG). 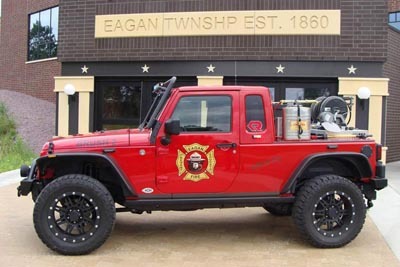 The Eagan Fire Department calls the Jeep "Smokey", and Smokey Bear is on the sides and hood. 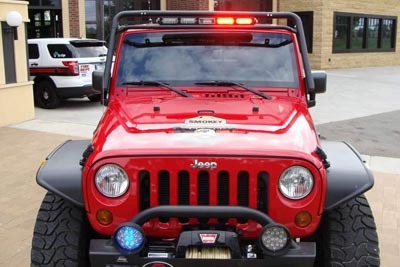 Burnsville provided new bumpers, winch, tires and wheels, and Bushwacker fender flares. Thanks to Bushwacker for the photos. 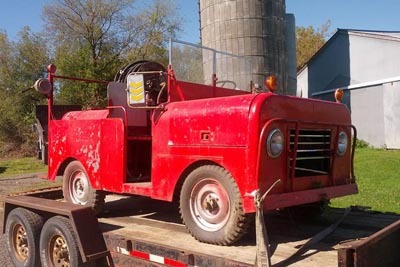 I don't know much about this one; it was pretty well stripped when it was spotted by Dave Eilers of eWillys, in a 2014 online auction. But once again it is different from the usual fire Jeep. A large front extension might have originally held a pump, but all that's left is a seat (which reminds me of one approach to hunting in Texas.) Assuming that they would fight grass fires by putting somebody up there with a hose, I don't think I would want to be the guy to draw the short straw. 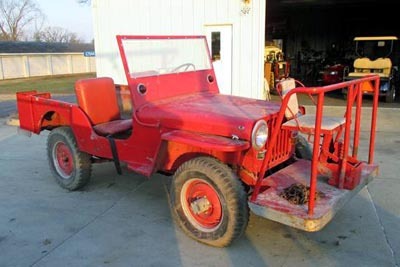 According to serial number 34134, it's a 1946 CJ-2A; the odometer shows 53,000 miles, and the engine has been removed. A rear extension is as big as the front one. It's nicely enclosed, with the taillights moved back, and a hole suggests there may have been some plumbing back there. Anybody recognize the origin of this one? See also a Civil Defense Rescue Truck from Minnesota.